The Navy aircraft carrier USS Enterprise was decommissioned last week after 55 years of meritorious service under 10 U.S. presidents. Deployments ranged from the Cuban Missile Crises in 1962 to first-strike operations after 9-11. The “Big E” was the world’s first nuclear-powered aircraft carrier and upon commissioning became the world’s longest ship at 1,100 feet. The video shows highlights of the Enterprise and last week’s observance. I was not aware until last week’s ceremonies that eight ships named Enterprise have served the United States since before the country was founded. I’m providing a summary, below, of the missions and adventures of all eight ships. For much of the information, thanks goes to Mass Communication Specialist 1st Class Eric Lockwood of the Navy’s History and Heritage Command. 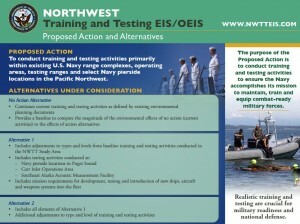 A dozen environmental groups say they will boycott the nine “scoping meetings” the Navy is holding to kick off a new round of studies regarding testing and training activities in the Northwest. In a letter dated March 13 (PDF 16 kb), the groups said the format of the meetings is not designed to encourage public discussion or even allow public comment. 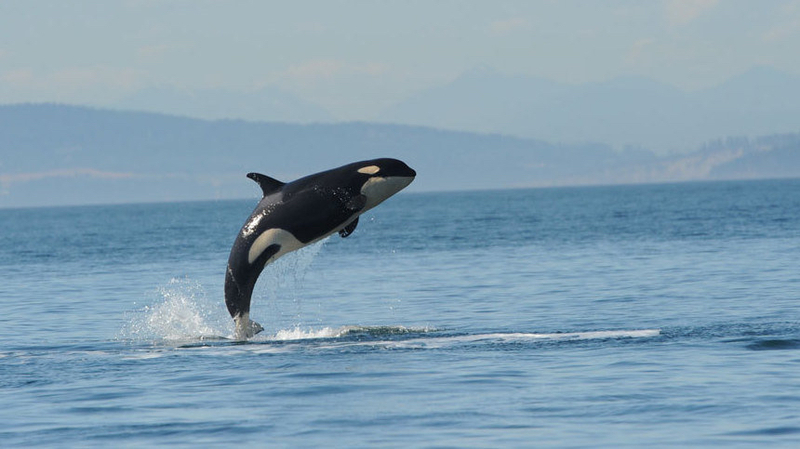 In addition, the Navy and the National Oceanic and Atmospheric Administration have ignored ongoing calls for the Navy to better protect marine wildlife and the environment along the Washington Coast and other biologically important areas, they say. 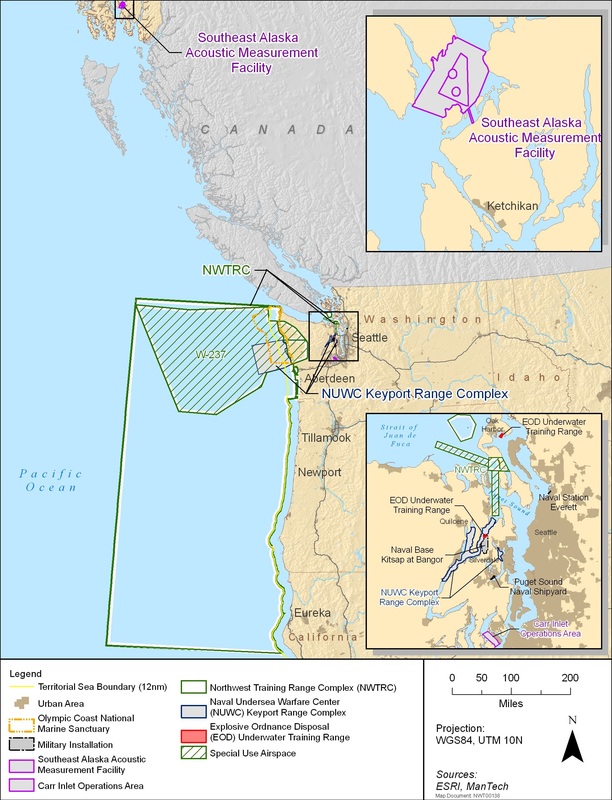 Navy's Northwest testing and training ranges. Click to enlarge. The Navy will seek a new permit from NOAA for the incidental harassment of marine mammals during testing and training activities. Most of the activities are identical to what is taking place now, but some new activities are added — including the testing of sonar from ships docked at piers. Between now and 2015, Navy officials will describe and study the effects of various activities on marine life and update existing mitigation with new research findings. See my initial story in the Kitsap Sun, Feb. 27, and a related post in Water Ways, March 6. Also, you may review the official notice in the Federal Register. I thought it would be great to pass along some water-related jokes linked to the Navy or Coast Guard. In searching the Internet, I found a few good ones, some clean and some dirty. It seems that most of the good jokes have simply been revised and recycled again and again through the years. There are plenty of bad jokes I would just as well forget. Here are my favorites that seem suitable for general audiences. If you have heard a good joke about the military that you can share in good conscience, please feel free to write it down in the comments section below. If you know the source or remember where you first heard the joke, please mention that as well. State shellfish biologists are organizing a volunteer work party to rescue oysters that apparently were washed up high on the beach at Scenic Beach State Park by a Navy ship. The guided-missile cruiser USS Port Royal operates off the coast of Hawaii during Rim of the Pacific (RIMPAC) in 2008. 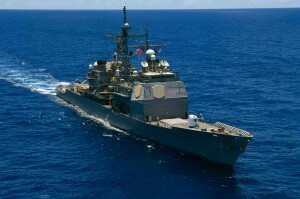 The USS Port Royal, a 567-foot guided-missile cruiser, was operating in the Navy’s Dabob Bay testing range on Thursday, and the oysters were found high up on the private beaches across Hood Canal the next morning. Frankly, I have never heard of this kind of damage from any ship, and I don’t blame readers for being skeptical. But there seems to be no question that the oysters were washed up on the beach, that the Navy ship was in the vicinity about that time, and that a ship of this size is capable of producing a huge wake. It’s called circumstantial evidence, at least until I find someone who actually saw something happening. Several years ago, residents living along Rich Passage between South Kitsap and Bainbridge Island complained that the wake of high-speed passenger-only ferries were washing away the gravel and undercutting their concrete and rock bulkheads. Washington State Ferries was ultimately forced to pull the ferries out of service. Local officials are still hoping they can find a ferry that can make it from Bremerton to Seattle in about half an hour without creating wake damage. I’ve also heard complaints from shoreline property owners about wakes from huge freighters. Such comments have come up during discussions about revised shoreline regulations that could become part of Kitsap County’s Shorelines Master Program. Some folks who live on the east side of the Kitsap Peninsula say wakes from these massive cargo ships cause more damage to habitat than anything a shoreline owner might do. If true, it may be time to address the wake issue, beginning with studies of actual damage caused when the ships come through. Do we need government intervention? I can’t say, but rules to control wakes could be problematic, because the movement of ships is mostly controlled by the federal government.